It’s a particularly warm day in mid-June and third-generation pastaio, or pasta maker, Giuseppe Di Martino is greeting farmers in Puglia the same way presidential candidates parade through cities. He shakes hands and laughs as he leads groups into the pale, gold-colored wheat fields for the ten-year anniversary of the region’s harvest festival, Festa del Raccolto. Puglia, the southern region forming the heel of Italy’s “boot,” is the heart of the country’s durum wheat production. The region has been growing wheat for over 2,000 years, since nearly 300 B.C., and produces over 200 varieties. “That’s the reason there was the Roman Empire—wheat,” Di Martino says. “If you were Roman, you didn’t have to pay for wheat; soldiers marched better if they had pasta.” On the opposite coast, Gragnano, the “City of Pasta” located south of Naples, was known for manufacturing “white gold,” or macaroni, in the sixteenth century. Pasta once hung to dry on racks placed in the street, and most of the companies were family owned, including Pastificio Di Martino. Now the Di Martino business is one of the handful left in the city, keeping tradition alive by collaborating with other famous Italian houses like Dolce & Gabbana on the fashionable prints wrapping their pasta products. Di Martino’s family has been in the business since 1912 and produces 900 tons of pasta per day (in over 120 different shapes). Last year, he expanded his empire to include the Sea Front Di Martino Pasta Bar in Naples (which offers a multi-course pasta dégustation menu similar to what you’d find in a Michelin-starred spot), a concept he’s taking across the Atlantic to New York City next spring. While dry pasta is half of the equation, the sauce is just as important. “Tomatoes are a big memory for every Neapolitan—and anyone who makes pasta—because of the abundance of the crop,” Di Martino says. In summer, families gather to bottle sauce, turning it into a week-long affair. Women wash the tomatoes while the older men carry boxes. If you’re over the age of five or six, you’re helping in the kitchen. “Everyone has a role and everyone is eating tomatoes,” Di Martino says, having just relived the experience a couple of weeks ago. Tomatoes make their way into every sauce. Skins are fried, and juices are slathered on bread like butter or cooked into a spaghetti sauce with anchovies and a squeeze of lemon, served as a cold salad. The dish sits out all day, and family members pass by and dip their fork in it while working. “That for me is more of a memory than a particular recipe,” Di Martino says. Tomato-based Neapolitan sauce is as Italian as ketchup is American. 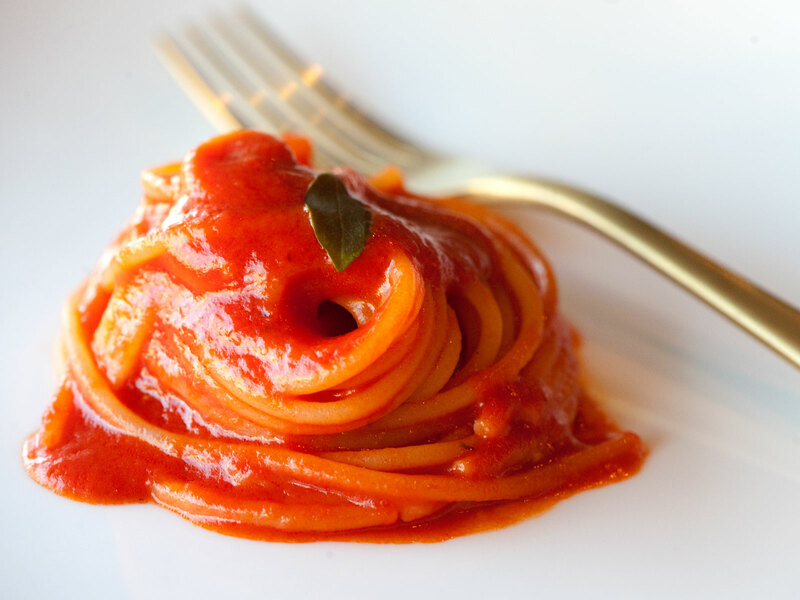 Here, Di Martino shares three of his top tips for perfecting tomato sauce like a pasta master. Create a balance between the pasta and sauce. 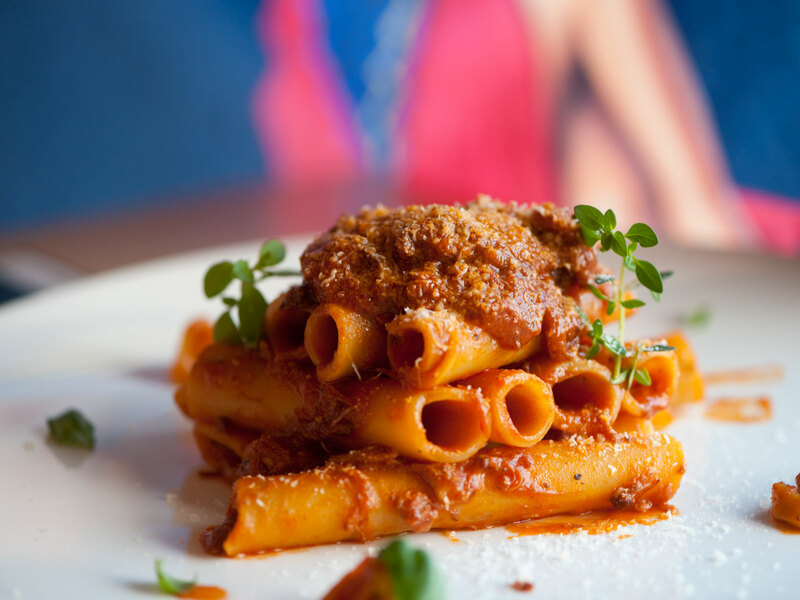 “What you want is an equilibrium between the acidity of the tomatoes and thickness of the pasta,” he explains. “The generic rule is the more acidic the tomatoes, the thicker the spaghetti.” Sweeter, yellow tomatoes that have a lemon zest flavor (and not much acidity) are perfect for thin spaghetti, because the pasta releases less starch when it’s cooked. “Your palate will have less contact with the pasta,” Di Martino says. The long, plum-like San Marzano tomatoes, meanwhile, are the holy grail of Italian tomatoes, since they offer the perfect balance of acidity and sweetness. These tomatoes are a favorite for passata—the base for Italian sauces—a purée or paste sans seeds or skins crafted from sieved tomatoes. The size of the pasta changes everything. Thicker pasta releases more starch and needs to cook longer, so it’s a better match with more acidic tomatoes. “Normal” spaghetti measures 1.7 mm and is what Neapolitans call the “perfect proportion,” Di Martino says. Balanced San Marzano tomatoes are an ideal match for this thickness, offering a beautiful, concentrated taste to the vivid red sauce. Thinner spaghettini, which is popular in the States, would be a perfect pairing with yellow tomatoes or cherry corbarinos, which are smaller than San Marzano tomatoes and add notes of citrus and herb.